Pick up from Hasimara and we will proceed to Phuentsholing for your permission procedure. Check in at hotel and take rest. 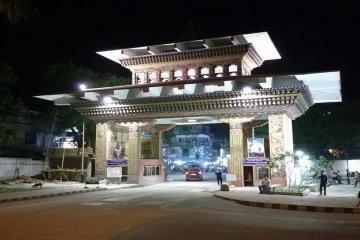 O/n stay in Phuentsholing. Today after breakfast you will start for Thimphu (approx 6 hrs). After you reach Thimphu checkin at hotel and take rest. In the evening roam around city of your own. The memorial stupa, thimphu, also known as the Thimphu Chorten, is a stupa in thimphu, bhutan, located on Doeboom Lam in the southern-central part of the city near the main roundabout and Indian Military Hospital. Great Buddha Dordenma is a gigantic Shakyamuni Buddha statue in the mountains of Bhutan celebrating the 60th anniversary of fourth king Jigme Singye Wangchuck. Motithang Takin preserve, located in the Motithang district of Thimphu, Bhutan is a wildlife reserve area for Takin, the national animal of Bhutan. Originally a mini-zoo, it was converted into a preserve when it was discovered that the animals refrained from inhabiting the surrounding forest even when set free. for stamps, Bhutan is famous for producing unique and innovative stamps. 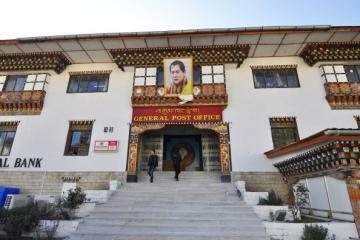 After selling peculiar “cd-stamps” Bhutan’s post office now offers personalized stamp; we invite you to surprise your family and friends with your custom-made stamp made with one of your favourite holiday’s photographs! this institute commonly known as ‘the painting school’ operates four-six years course that provides instruction in Bhutan’s 13 traditional arts. Students specialize in painting, woodcarving, embroidery or statue making. the museum is a restored three story traditional rammed mud and timber house inaugurated as a museum by her majesty the queen Ashi Dorji Wangmo in 2001. It showcases the traditional artefacts’ used now and in the past, which helps connect people to the Bhutanese rural life. the art of handmade paper in Bhutan dates back to the 8th century, although usage was limited mainly to religious purposes. Today it is considered an important element in the preservation of Bhutan’s cultural heritage. The factory allows guests to view the paper making process and purchase gifts from their showroom. after breakfast we will drive (45 mins) from Thimphu to Dochula Pass (3050 mts.) during clear day you will get a chance to see Himalayan mountain ranges of Bhutan. 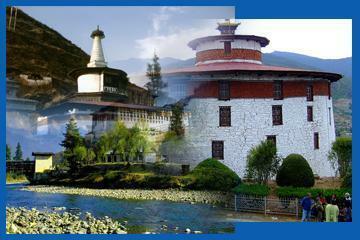 Enjoy a spectacular view highest mountain of Bhutan at a site that stretches almost 180 degrees. The beauty of this place is further enhanced by the Druk Wangyal Chortens – a 108 stupas built by the eldest queen, her majesty Ashi Dorji Wangmo Wangchuck, after a short tea break continue drive to sub tropical Punakha. temple also known as the temple of fertility, 30 mins. Walk from the road to the Lhakhang is through open farmland and rice paddies. It is believed that a demon who had been terrorizing the valley transformed herself into a black dog to escape the wrath of Drukpa Kuenlay, the divine madman. 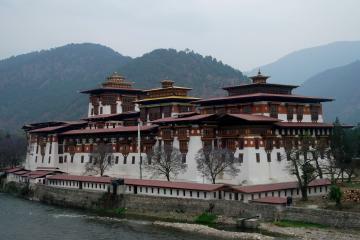 the Dzong is considered one of the most important and also one of the most beautiful Dzong in the kingdom. It was built by Zhabdrung Ngawang Namgyel in 1637, and was the seat of the government every winter until Thimphu was established as the permanent capital in 1955. It is still the residence of the Dratshang (central monastic body). Take a time to admire the impressive, colourful and detailed artistry of the surroundings, including huge statues of Buddha, Guru Rinpoche and Zhabdrung Ngawang Namgyel, as well as paintings of one thousand Buddha’s. O/n in Thimphu. housed in the Ta Dzong (watch tower) of the Rinpung Dzong. In the museum the intriguing collection of artifacts serves as a great introduction to the rich culture and heritage of the kingdom. The national museum boasts a rich variety of exhibits collected from all over the country and belonging to different eras, some as early as 2000 b.c.a visit through the galleries shows the country’s transition the later stone age to a modern Mahayana Buddhist Kingdom. 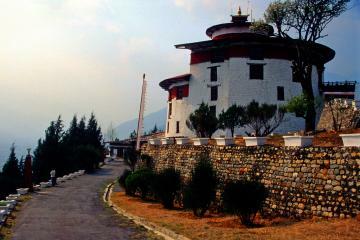 jangtsa dumgtseg lhakhang [zlum brtshegs lha khang] is a Buddhist temple in western Bhutan. The temple is notable as it is in the form of a Chorten, very rare in Bhutan. Evening explore beautiful town of Paro which is typically Bhutanese architecture. O/n at Paro. 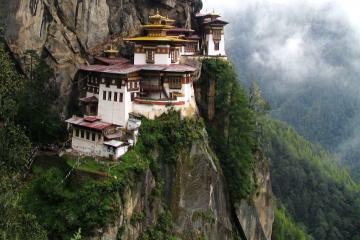 tiger’s nest or Taktshang Goempa is one of Bhutan’s most revered monuments. It literally hangs off the face of a cliff 900 meters (2952feet) above the valley floor. The legend states that guru Rinpoche flew in to Bhutan on a mythical tigress and meditated in a cave before bringing Buddhism to Bhutan. The Taktshang Goempa is built around the cave which is opened to the public once a year at the end of august. The four-hour round trip hike offers spectacular views of the Goempa and the valley below. Horses or mules can be arranged on request to help lighten the journey. the 7th century monastery is one of the oldest and most sacred temples in the kingdom where the seed of Buddhism was won in Bhutan. The Tibetan king, Songsten Gampo ordered the establishment of monasteries in the Himalayan region to subdue evil spirits and to spread Buddhism. Of the 108, which were to be built, two major ones were built in Bhutan namely the Kyichu Lhakhang and Jampa Lhakhang in Bumthang. Kyichu Lhakhang, which pins down the left foot of a treacherous ogress, is a great finish to this day of cultural immersion and your journey to this ancient kingdom of Bhutan. a ruined fortress where Bhutanese warriors fought Tibetan invaders centuries ago. In the early 1954, the Drukgyel Dzong was completely destroyed by fire and today only the ruins remains. The snowy dome of sacred Chomolhari, mountain of goddesses; can be seen in all her glory from the approach road to the Dzong. Today after breakfast proceed to Hasimara for your onward journey. Tour Ends with Happy & Wonderful Moments with TOURIST CLUB. for stamps, Bhutan is famous for producing unique and innovative stamps. After selling peculiar cd-stamps Bhutan’s post office now offers personalized stamp; we invite you to surprise your family and friends with your custom-made stamp made with one of your favourite holiday’s photographs. 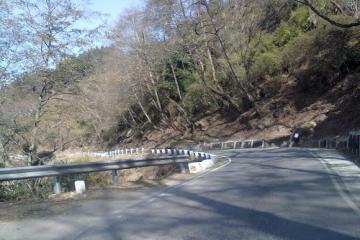 after breakfast we will drive (45 min) from Thimphu to Dochula Pass (3050 mts.) during clear day you will get a chance to see Himalayan mountain ranges of Bhutan. 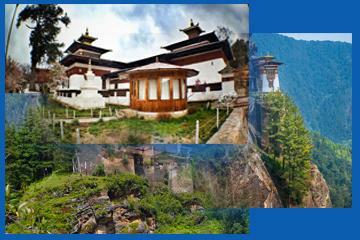 Enjoy a spectacular view highest mountain of Bhutan at a site that stretches almost 180 degrees. The beauty of this place is further enhanced by the Druk Wangyal Chortens – a 108 stupas built by the eldest queen, her majesty Ashi Dorji Wangmo Wangchuck, after a short tea break continue drive to sub tropical Punakha . take in the amazing architecture of this 17th century monument, a premier example of Bhutan’s architecture. Paro Dzong, built in 17th century to defend Paro from the Tibetan invasion, is also known as Rinpung Dzong, which means the ‘fortress on a heap of jewels’. This fine example of Bhutanese architecture now serves as a central monastic and administrative seat of the Paro district. From the Dzong, a leisurely walk back into Paro town crossed the scenic Nyamai Zampa, a unique model of Bhutan’s traditional cantilever bridge. jangtsa dumgtseg lhakhang [zlum brtshegs lha khang] is a Buddhist temple in western Bhutan. 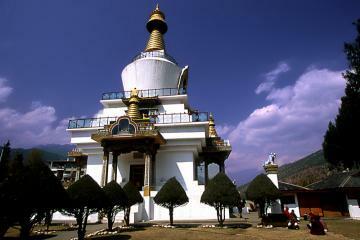 The temple is notable as it is in the form of a Chorten, very rare in Bhutan. Evening explore beautiful town of Paro which is typically Bhutanese architecture. After that you will transfer to Thimphu. Check in to your hotel and O/n Stay. Today after breakfast you will start for Paro (approx 6 hrs). After you reach Paro check in at hotel and take rest. In the evening roam around city of your own. Pick up from Hasimara and we will proceed to Phuentsholing for your permission procedure. Check in at hotel and take rest. O/n stay at Phuentsholing. PICK UP AND DROP FROM HASIMARA. ACCOMODATIONS AT DESIGNATED HOTELS AND RESORTS. MEAL PLAN IN MAP (Breakfast & Dinner). ALL INTERNAL TRANSPORT AS PER ITINERARY. GUIDE CHARGES OR PORTER CHARGES. 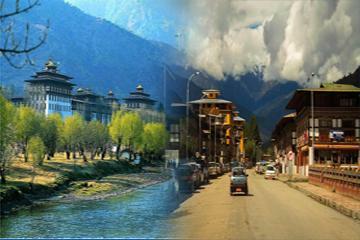 PHUENTSHOLING : BHUTAN HOTEL / ASIAN KITCHEN / HOTEL HILL VIEW /SIMILAR. 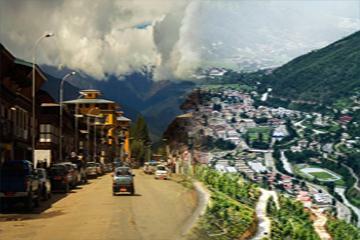 THIMPHU : HOTEL WOOD / WELCOME HOTEL / DINSHA HOTEL / SIMILAR. PARO : HOTEL DRAGON / YERKAL HOTEL / HOTEL PAROPHUNSHUM / SIMILAR. Designed & Developed By Onnet Solution Infotech Private Limited.